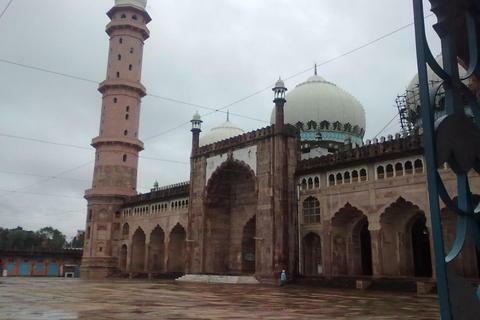 Taj-ul-Masajid is a mosque located in Bhopal. The name is also written as Taj-ul-Masjid. However, the correct name is Taj-ul-Masajid. "Masajid" means "mosques" (plural of "asjid" and "Taj-ul-Masajid" literally means "crown among mosques." It is the largest mosque in India and one of the largest mosques in Asia. it was initiated during the reign of the Mughal emperor Bahadur Shah Zafar of Nawab Shah Jahan Begum (from 1844 to 1860 and from 1868 to 1901) of Bhopal (wife of Baqi Mohammad Khan) and continued to be built by his daughter Sultan Jahan Begum, until The mosque was not completed due to lack of funds, and after a long period of sacking after the war of 1857, construction was resumed in 1971 by the great efforts of Allama Mohammad Imran Khan Nadwi Azhari and Maulana Sayed Hashmat Ali Sahab of Bhopal The construction was completed in 1985 and the entrance door (east) was beautifully renovated using ancient motifs from around 1250 Syrian mosques with the contribution of the Emir of Kuwait to commemorate the memory of the deceased wife. with a pink façade surmounted by two 18-story octagonal minarets with marble domes. The mosque also has three huge bulb domes, an imposing main corridor with attractive columns and marble floors reminiscent of the Mughal architecture, such as Jama Masjid in Delhi and the huge Badshahi Mosque in Lahore. It has a courtyard with a large tank in the middle. It has a double-floor entrance hall with four recessed arches and nine cusp-shaped multi-purpose openings in the main prayer hall. The Quibla wall in the prayer hall is sculpted with eleven recessed arches and has thin lattice work screens. The massive pillars in the lobby house 27 ceilings through the overhanging arches of which 16 ceilings are decorated with ornate petal patterns.